1. There is a webcast of the introductory speeches by Chairman Ken MacKenzie and CEO Andrew Mackenzie at https://edge.media-server.com/m6/p/gesyeeo5 (registration is necessary). BHP no longer posts a video of the whole AGM on its website, presumably to avoid publicising the many criticisms against the company: the question and answer session on the Annual Report was entirely dominated by challenges to the company for its record on human rights, including indigenous and worker rights, and environmental impacts, including climate change. As last year, there was a ban on the use of all electronic devices during the AGM so I was unable to type notes straight on to my laptop. I assume that this is also intended to ensure that the publication of a timely report on all that was said at the AGM is rendered more difficult. 2. In his opening remarks, company Chairman Ken MacKenzie spoke briefly about the Samarco tailings dam collapse in Brazil in November 2015, saying that the companies involved, including BHP, had agreed with the Brazilian government to give even more help to communities (suggesting, of course, that the help given so far has been adequate, even generous, rather than minimal and inadequate). He spoke of the ‘tragedy’ of Samarco, as though it were something for which the companies were not entirely responsible. 3. Company Chief Executive Officer (CEO) Andrew Mackenzie said he looks forward each year to the London AGM. (I do not share that feeling…) He said that safety is the top priority for the company. He regretted the death of two colleagues at BHP’s operated assets in 2017. 4. He said there had been progress in the recovery of communities and ecosystems affected by the Samarco disaster. He had visited the Samarco operations in May and been impressed by the technical expertise, compassion and dedication of the staff involved. They were working closely with the Renova Foundation (established by the companies involved to handle compensation and rehabilitation in the wake of the disaster). Community participation is key, he said. Three communities need to be relocated and rebuilt. It is expected that this process will be completed by 2020. Almost 10,000 financial assistance cards have been given to those affected, including those making a living by fishing. Plans for the rehabilitation of 40,000 hectares of affected land are in their final stages of preparation. He said that BHP is “determined to do the right thing”. 5. He said that investment in host communities is key to what BHP does. The company is committed to openness. A water report was launched in August, and this represented a step forward in water governance and quality. 7. And then he broke the news that many shareholders wished to hear – indeed, for some shareholders present it appeared to be the only thing they care about. The company had declared a record final dividend to shareholders. At least those who live in temperate metropolitan countries and who will die before the worst impacts of climate change kick in can spend a few more years enjoying the wealth extracted from the labour of mine workers and land taken from indigenous, African-descent and peasant communities. “O pardon me, thou bleeding piece of earth, that I am meek and gentle with these butchers!” as Mark Antony says over Caesar’s murdered body in Shakespeare’s Julius Caesar, Act III, scene I – though I can’t think why this quote comes to mind in the context of a mining company AGM. 8. Andrew Mackenzie noted that BHP now has only 13 operated assets, down from 30 three years ago, and that this simplification of its structure was an advantage. He said that protectionism undercuts confidence and destroys productivity. (He did not mention any particular President of any particular country in this context.) However, he seemed optimistic: urbanisation will increase the demand for electrification and fertilisers, leading to increased demand for BHP’s copper and phosphates, and BHP will capitalise on the shift to a low-carbon future even while it profits from the earth-shattering death throes of the fossil fuel economy (I paraphrase). 9. Finally, Andrew Mackenzie noted that progress had been made towards gender balance in BHP’s work force and that the company wants to increase female leadership. There is more flexible working in the company now than before, the gender pay gap is being addressed and female recruitment in the past year had reached 40% and the company is aiming for 50%. Jolly good. Perhaps having more women involved will reduce the amount of destruction; though casting my mind back over the last 40 years’ worth of British Prime Ministers, I doubt that the connection is automatic. The Chairman then called for questions. 10. Paul Robson, of London Mining Network, asked about the Fundao Tailings Dam collapse at the Samarco operations in Brazil in 2015. He said: “The remarks by the Chair and the CEO had a strong focus on safety. 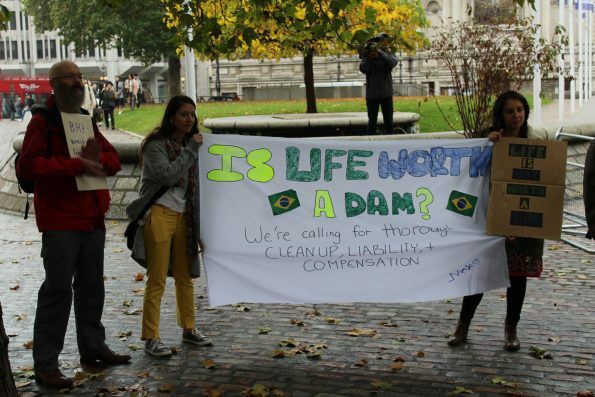 There was no mention, however, of tailings dams – despite the fact that tailings dams are the principal safety issue facing the mining industry and that a tailings dam of this company suffered a catastrophic collapse three years ago in Brazil. Can you give this meeting a clear statement of the steps being taken to improve the safety of tailings management? 11. 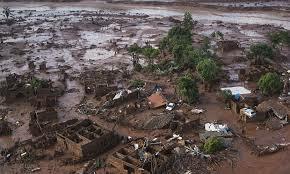 “We are approaching the third anniversary of the catastrophic collapse of the Fundao tailings dam in Brazil. Fifty million cubic metres of mining waste entered at high speed an already polluted river basin. There is not yet a comprehensive scientific report of the impacts of this disastrous event. It is curious that we do not have such a statement three years after the disaster. The company’s annual report presents some isolated results without giving the source and with no context. 12. “Renova has contracted the International Union for Conservation of Nature as advisors on environmental recovery. The main recommendation is that a comprehensive scientific assessment of the impacts of the dam collapse be carried out and published with urgency. 14. Rather than responding to Paul’s question straight away, Chairman Ken McKenzie asked for all questions on the Samarco disaster to be asked so that the company could answer them all together – or perhaps so that they could avoid answering the more difficult questions while ensuring that the questioners could not easily insist on receiving an answer. 15. Leticia Oliveira, from Mariana, the community in Brazil closest to the Samarco iron ore mine where the Fundao tailings dam collapse took place, and representing MAB, the Movement of People Affected by Dams, said: “It has been almost three years since the Samarco crime in the Rio Doce basin took place, and only one out of three hundred houses has been rebuilt for affected communities. I have some questions regarding this situation. 16. “You are always creating rules and categories that exclude some affected people from the process of reparations. To this day, almost three years since the crime, there are many people who have not been recognized, especially women, fisher folk, people who collect gold from the river and people who have been left without access to water at some point. Non-recognition creates more problems and more stress for those who have been affected, it means making them invisible and re-victimizing them. When will you recognize all of the different types of people who have been affected by the crime? 17. “My second question is very simple: When will people be able to have their lives back? When will fisher-folk return to fishing, when will farmers return to cultivate the land, when will the laundresses return to wash the clothes on the river, when will people have their houses back? Or will these people not be able to do that, will they have their way of life back? And will you compensate these people for the loss of their way of life, until they are able to get it back? 19. 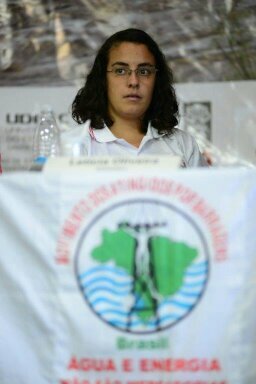 Lucineide Soares, from Brazilian trade union CNQ/CUT, said she represented workers from Samarco. Redundant workers should also be considered victims of the dam failure, but the Renova Foundation does not recognise them as victims and they are receiving no systematic support. They had suffered loss of work and health impacts including depression. What would BHP do for these workers? Would they be dismissed? 23. He said that the company would work along the lines of the agreement with prosecutors. “We are providing funds to ensure access to the best possible experts and mediation. We are funding this under the prosecuting authorities. On the rebuilding of communities, we share the desire to make fast progress. Ground clearing is necessary before the resettlement of Bento Rodriguez. The delay is because of our inability to get all the necessary permits to build a town, to clear the area, and agreement on the town plan. We have to work on the other two communities, too, Paracatu and Gesteira. We have purchased land to reconstruct but the licensing process is slow. At Gesteira the landowner is asking much more than the market value of the land. We are at stage 3 for the biggest community, stage 2 for the next community, and stage 1 for the smallest community. We will have to follow all legal and regulatory processes but are pushing hard to finish it as quickly as possible. 24. “Regarding Candonga,” he continued, “the river flows into the Rio Doce. It used to be a significant hydro dam. It held up the majority of the tailings from Samarco, but is now filled with sediment. We must decide with the authorities how much to move and how to make it safe. The tailings are inert, they are no creating a prolonged pollution issue so it may be best to leave them there. But we have moved some, putting them behind secure walls to allow them to dry out. There have been some problems and we have stopped work while we determine the best way forward. 26. Louise Winstanley of ABColombia, working on behalf of development agencies CAFOD, Christian Aid, Oxfam, SCIAF and Trocaire, said: “I would like to address my question to the historical legacy of BHP Billiton in Colombia in relation to one of the largest open pit ferronickel mines exploited by BHP, the Cerro Matoso mine. This mine was spun off in 2015 to South 32. 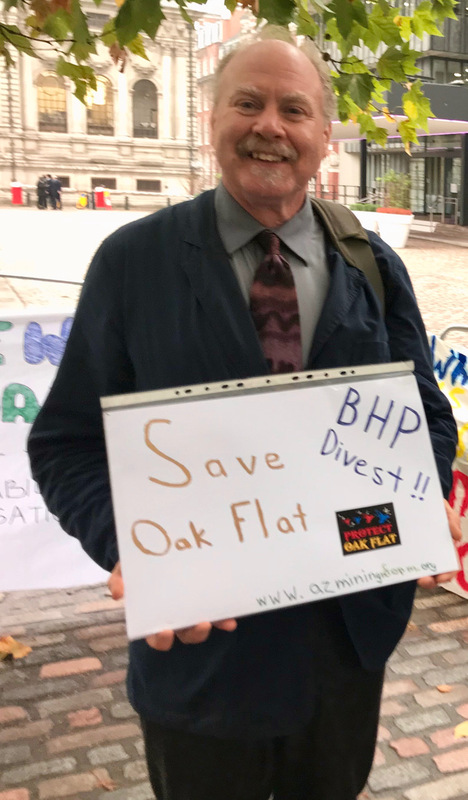 I am aware that BHP has passed all its obligations and liabilities on to South32, but given the importance that BHP places on a good reputation and its desire to do the right thing – it was good to hear Andrew Mackenzie earlier re-iterating BHP’s determination to do the right thing – I want to ask that BHP not walk away from its historical responsibilities. 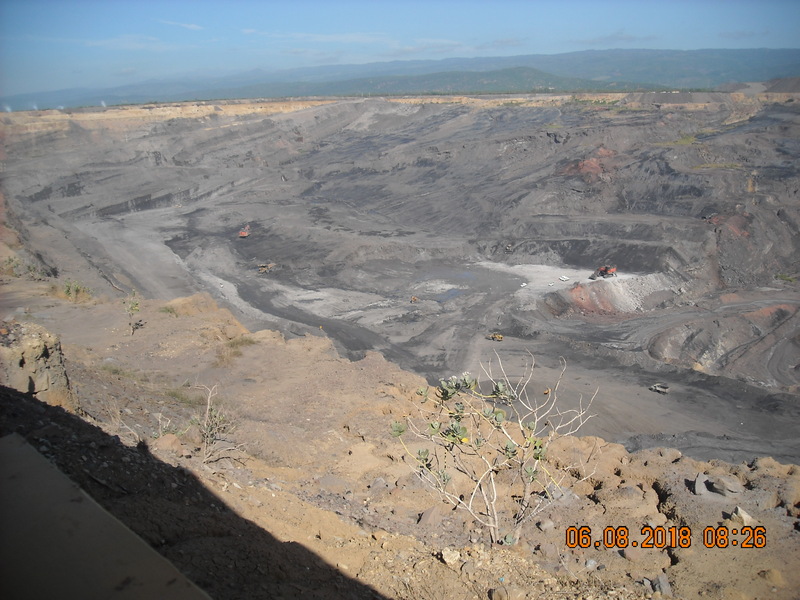 27.”The Cerro Matoso mine is situated in the territory of indigenous peoples at risk of – according to the Colombian Constitutional Court – physical and cultural extinction. 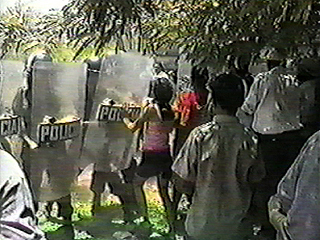 Whilst BHP owned this mine it was made aware by the communities and NGOs of – in addition to other things – the life-threatening diseases linked to mineral exploitation they were experiencing. At that time the community were discussing with BHP about paying for an independent medical study. This medical survey was finally undertaken by the Institute of Legal Medicine and Forensic Sciences and the results were presented to the Colombian Constitutional Court. The report indicates nickel levels in blood and urine samples of indigenous and Afro-descendant communities living around the mine and up to 15 km away in amounts significantly – and I really do mean significantly – higher than World Health Organisations (WHO) recommended levels. The information presented to the Constitutional Court also demonstrated air pollution, soil and water contamination. The Indigenous community members have been diagnosed with serious health complaints, like lung cancer and other deadly diseases. • set up an ethnic development fund for the community. 31. Misael Socarras, from the indigenous Wayuu village of La Gran Parada, one of the many communities affected by the Cerrejon Coal mine (of which BHP owns 33%) in the province of La Guajira, Colombia, said: “I am from La Gran Parada, in La Guajira, from the Ipuana family, and I live close to the train from the mine to the port. 32. “My first question is about water. How do you plan to repair the damage done to the water sources of La Guajira, given that there are already 17 streams that have dried up? And how do you plan to resolve the uncertainties of the constitutional court judgement on the diversion of the Bruno stream? 34. Ken Mackenzie called for all questions on Cerrejon before he would answer. 35. Rosa Maria Mateus from Colombia began her speech by saying ironically that the people in charge of the company looked very well seated on the platform, making reference to their interest in demonstrating their power from the physical layout of the AGM. She went on: “My name is Rosa María Mateus Parra, and I am part of the Jose Alvear Restrepo Lawyers’ Collective, an organization that defends human rights in Colombia. 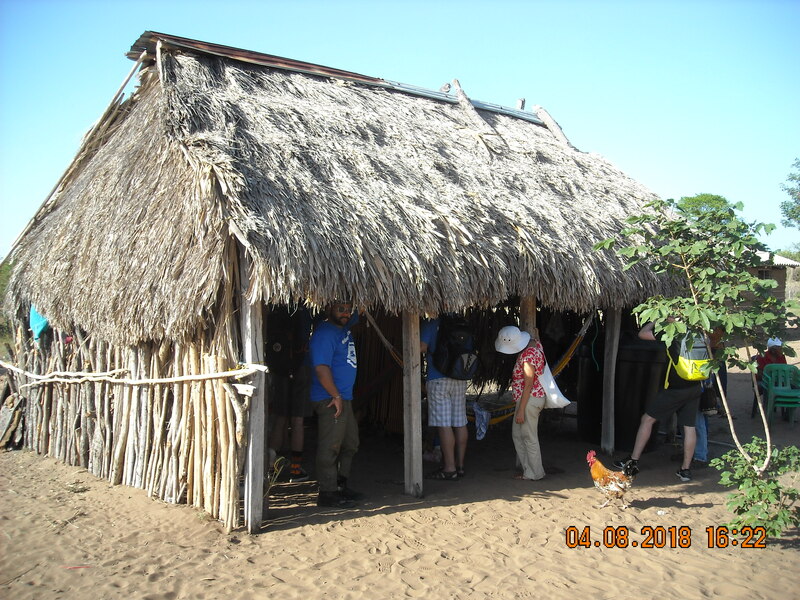 We are here because we accompany the communities of La Guajira that have been and continue to be affected and damaged by the Cerrejón mine; and we have verified your responsibility in the damage and the lack of reparation. 36. “The coal from which you make your profit is coal smeared with blood, with the tears of women who mourn their territory, with children sick from coal dust, either through skin outbreaks or respiratory problems; with communities that have lost so much: their territories, their water sources, their culture, their ancestral spirituality, and their language. 37. “But we know that it is useless to insist on this, unfortunately you can never understand the damage we are talking about or its gravity. 38. “It may be that the world is condemned to suffering the invisible dictatorship of finance and profits, and that no one in this auditorium is worried that the money they receive comes at the cost of the life of a Wayuu child. Maybe it doesn’t matter because it is not your child who will not be able to sleep tonight due to a coughing fit, and it does not matter because you will not be the parents and the mothers who will cry because their children die of thirst and hunger. In La Guajira, more than 4,000 children have died because of this. 39. “It may be that the world is condemned to live under the spell of the words of those who lie, who deceive and take advantage of the vulnerability of people. 40. “It may be that you are condemned to white-washed reports on Social Responsibility, and therefore it may be that you are condemned to lies: because the communities have not been resettled; because BHP has a historical debt to the community of Tabaco, because there are judicial sentences against the company that they have not fulfilled, because this company does not respect the parameters of the right to Prior Consultation, because the child Moises Guette Uriana continues to breathe contaminated air, because you own a mine in a country that does not meet international environmental standards. 41. “We are not going to ask questions, we asked them last year and they remain unanswered, the situation does not change, the tendencies and patterns are evident: Power asymmetries that impede relations from developing in equal conditions, revolving doors that are equal to corruption, and irreparability of the damage if you continue with the extraction. 42. “You have failed us and we have no other option but to continue to demand for the rights of communities and the environment, and we will use all means available. 45. Aldo Raul Amaya Daza, President of Sintracarbon, the Colombian union of coal mine workers which organises workers at the Cerrejon mine, said that he works in the Cerrejon mine. He said that when BHP had arrived in the area they were smiling. But the mine had created health problems for workers and many problems for the communities affected by its operations. There had been a death at Cerrejon recently. One concern, given the possibility of coal markets diminishing because of global action on climate change, was what would happen when mining comes to an end. He asked for the mine closure plan and for commitments on health and safety. He invited Ken McKenzie to visit the Cerrejon mine. 46. 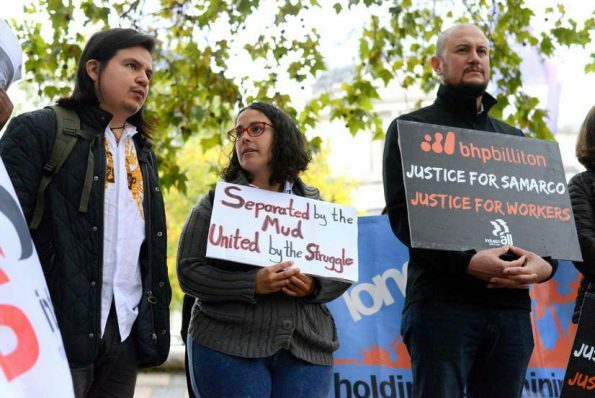 Hidanora Esther Perez Camposano, also from the Sintracarbon union at the Cerrejon mine in Colombia, stood up, and Ken MacKenzie interrupted her almost immediately, saying that she could meet with the Board after the AGM. ” Keep your remarks short and go to your questions,” he said – rather crossly, I thought. 49. Andrew Mackenzie added: “There is more to do. We need to improve things. With our renewed commitment to non-operated joint ventures we are putting in more effort. The track record is not all bad. There are people who are not happy but many community members and workers are grateful for the economic impact that Cerrejon has in that poor region of Colombia. How do we balance the rights and spiritualisms of indigenous peoples and the impacts of inter-culturalisation to allow greater self-determination and spiritualism?” [I suspect that Andrew Mackenzie is not familiar with anthropological terminology, let alone Indigenous spirituality….] “We are upgrading policies and will put them into practice. 50. “On resettlement, a significant number have been resettled and the approach has changed. We favour free prior informed consent. Not all resettlements have gone well. Water is a problem and we push Cerrejon management to do better and they push themselves to do better. Only 7% of Cerrejon’s water is of a quality that could be used for human consumption and we have gone beyond our duty to improve water security for local people. 20,000 people in 300 communities have benefited from that. We understand the constitutional court decision about the Arroyo Bruno diversion. We thought we had consulted widely but we will do so more widely and not do the project before that. 51. “On gender balance, we need to do more on that to build better more welcoming culture and work practices. 52. “Regarding the life of the mine, we only have a lease until 2034 and we don’t know if we’ll go beyond that. We have strong obligations to have a closure plan but we don’t see it being implemented for a long time. This is high quality low cost coal, potentially a 100-year resource. We don’t see it closing when our license runs out and we think the mine can continue for much longer without seeking alternative economic activity. 54. Roger Gerry, representing Share Action, asked a question about BHP’s audit of its key differences from the main industry lobbying alliances of which it is a member. He asked if the company would publish an updated audit of its trade association memberships. 75. Kirstine Drew, from the Trade Union Advisory Committee to the Organisation for Economic Co-operation and Development asked about BHP’s attitude to worker rights, trade unions and outsourcing. 77. Another shareholder from Port Hedland, Western Australia, said that when she was a child she was told that mining iron ore would help reduce poverty, and that Australian iron ore exports could help build cities of a million people in six weeks. She said: “I’m very concerned to hear from people around the world about it is causing loss of home, health and livelihood, so much so that they come across the world to talk to the Board about what they are suffering. How can we build cities of a million people in six weeks when we are a mining company? One ship holds enough to build 6000 houses and we fill 6 ships a day. We are good at making money and I like that.” Referring to BHP’s social investments, she said, “It is good that you put that money into schools around the world.” But she warned, “Children fall in love with the mining industry but they are asking the same questions as we are asking today. My grand-daughter, who is 10, had to move out of Port Hedland because her 12-year-old brother developed respiratory problems. Children are learning about environmental problems. The money is there and we can spend it on fixing problems rather than saying we are having conversations with you.” She offered to the Board some reports about the impacts of dust contamination in Port Hedland. She said that the reports themselves were physically marked with iron ore dust to bring the point home. She had attempted to bring some small pieces of iron ore from Port Hedland into the AGM but had now be allowed to do so because “it was judged to be unsafe”. 79. Roger Featherstone, from Tucson, Arizona, in the southwestern USA, said: “I am the Director of the Arizona Mining Reform Coalition. Thank you for hearing me again this year. I have a question about BHP’s involvement with Rio Tinto in the proposed Resolution Copper mine project. 80. “BHP and Rio Tinto are planning a large underground block cave mine, an hour east of Phoenix, Arizona, that would destroy Oak Flat, render permanently unusable 7,000 acres under a toxic tailings dump, and send mineral concentrates out of the US for final processing in another country, most likely, China. 81. 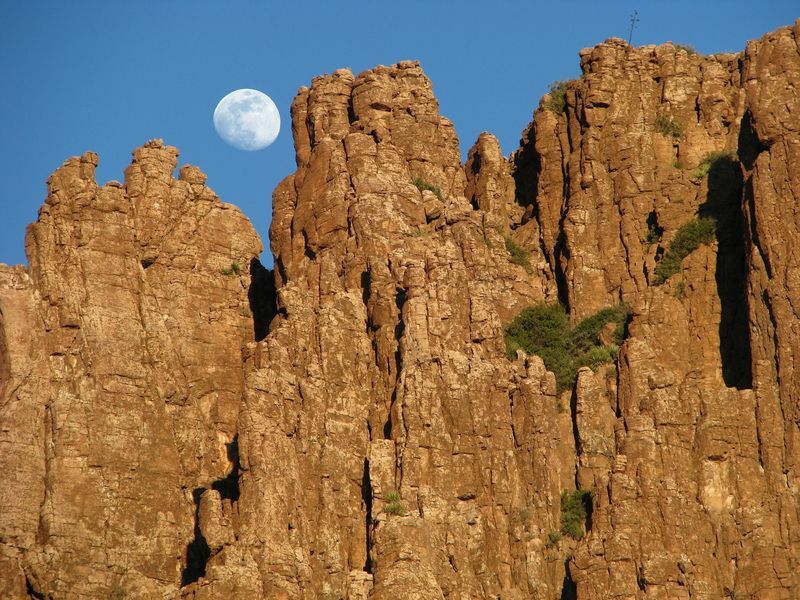 “As you know, there a number of problems with this proposed mine because Oak Flat is sacred to Native Americans and an ecological and recreational haven. • It is clear that the current tailings location is not viable from an ecological or technical standpoint. • The plan calls for a tailings dam engineered exactly like the failed dam at Samarco. • A new report shows that Rio Tinto’s proposal has not seriously considered additional very hot water deep underground or taken into account the additional amount of power needed to cool the mine and to to pump the additional water. 83. “The report recommends that anyone investing in the project take a serious look at the projects flaws. I have a copy of that report I’d like to share with you, and a summary handout is available to the shareholders. 88. Ken MacKenzie said, rather curtly, that he had already answered the point. 89. 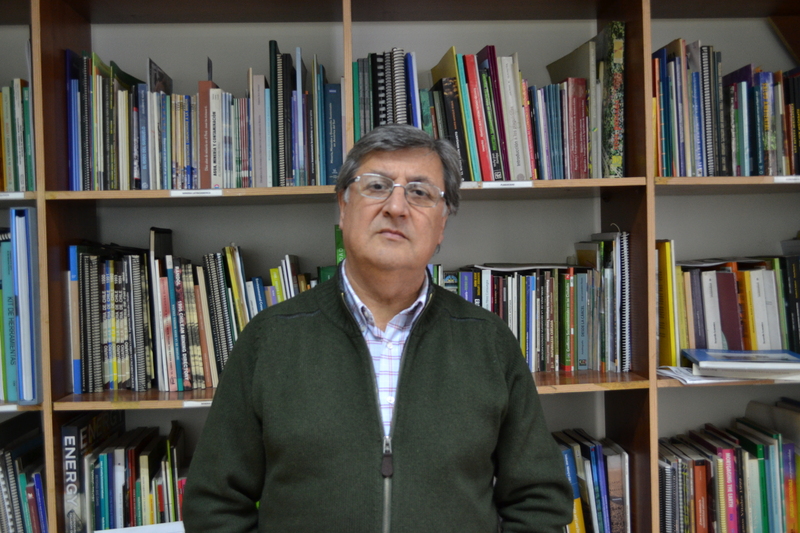 Lucio Cuenca, from Chile, said: “Good morning. My name is Lucio Cuenca, I am the director of the Latin American Observatory of Environmental Conflicts, OLCA – an organisation that supports communities affected by mining in northern Chile, a number of whom are affected by BHP operations. I bring to this assembly questions about the rights violations of indigenous peoples, of destroyed ecosystems and of over-exploited water sources. 90. “I want to ask about the BHP Escondida Project. This project extracts vast amounts of water from the ecosystem of the Punta Negra Salt Flat and the Atacama Salt flat. The damage and impacts to these valuable ecosystems have been denounced for several years by environmental organisations, parliamentarians, but especially by the Licanantay indigenous community from the town of Peine. A situation that’s been denounced by the Chilean parliament, through a special commission. 91. “Although the company announced in 2017 that it had stopped extracting water from the Punta Negra Salt flat, nothing has been said about evaluating historical ecosystem and socio-cultural damage caused, nor about the restoration or repair of the salt flats. 92. “In the case of the Atacama Salt flat, where the company’s environmental license to extract water ends in 2018, the company has presented a new project – Monturaqui – to extend the extraction of water for an additional 11 years. 93. “How will you address the damage caused to Punta Negra Salt flat for their ecosystem repair? It is simply not enough to keep irrigating superficially and if the company made a strong investment in seawater desalination, which is fully operational since 2017, why not stop using fresh salt water now? 94. “The indigenous Aymara community of Cancosa is the community which lives closest to the Pampa Lagunillas wetland, where the ‘Continuity plan for the BHP operation, Cerro Colorado’ will permit the company to draw underground water until the year 2023. 95. “This indigenous community has been systematically denouncing the environmental and cultural impacts caused by the destruction and drying up of water sources; and the intervention of archaeological sites, in a community that has 9000 years of history. “Although the continuity plan for Cerro Colorado obtained an environmental license in 2015, this was carried out through an Indigenous Consultation which did not include the Community of Cancosa, as established in ILO Convention 169. 96. “Currently, there are legal processes that seek to annul the environmental permit, and there are new, very serious complaints of environmental infractions, and breach of protocols, at the Environmental Ombudsman and the Council of National Monuments. 100. There were a few more questions from individual shareholders about dividends, share value and corporate simplification, including one from a shareholder who attends a number of mining company AGMs, listens to testimony from representatives of numerous communities suffering human rights abuses and environmental damage caused by whichever company it happens to be, and then speaks about the importance of dividends and announces that his wife either is or is not happy with the current dividend level. At this AGM, I felt that he outdid himself in insensitivity towards the people who had travelled from the ends of the earth to tell shareholders about the impacts of BHP’s operations on their lives and livelihoods: he ended his intervention with an angry denunciation of the great evil represented by the corporate tax policies of Jeremy Corbyn MP, leader of the UK’s Labour Party. This represented, he said, a “shocking attempt to get hold of 10% of our shares.” Goodness: doesn’t that just totally eclipse the death threats, dislocation and dehydration faced by the company’s critics?